Few would consider Microsoft (MSFT) to be an apt market predictor -- but in television it has a real shot. The company has historically had terrible timing, whether way too early (tablets) or way too late (Windows 7). But in a corporation with so many discrete engineering projects, and so many talented programmers, is it possible that a few of them could align into something market-leading? If ever there was a market primed for it, it would be "smart TV," the emergent heart-throb of every big-cap company from Google (GOOG) and Intel (INTC) on the tech side to Walmart (WMT) and Target (TGT) on the retail side. To be clear, Microsoft doesn't have any new, unified approach to TV -- at least not publicly. But what it does have is the makings for a quick and formidable entry into the market. While Google is stuck shoe-horning and tailoring its Chrome OS (or perhaps Android) into Intel's new TV hardware, Microsoft already has much of the hard work done. 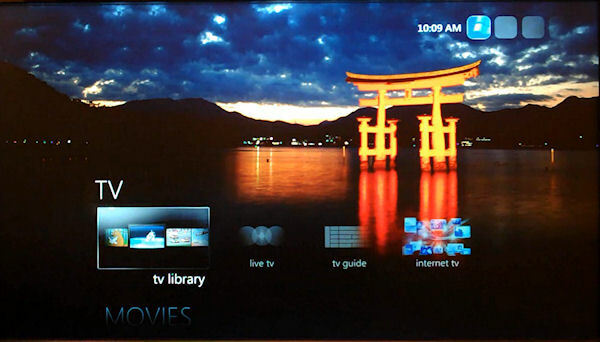 Its Windows Media Center software for Windows 7, which turns your PC into a remote-controlled DVR and media manager, is perhaps the best PC-entertainment user interface on the market, to say nothing of its functionality, which blows away competing products like Apple's (AAPL) Front Row or Apple TV. Google's approach is also intrinsically more Web-oriented, since both Chrome OS and Android are designed with always-on Internet connections in mind. I think I'm not alone in hypothesizing that many smart TV buyers won't be Internet-savvy early adopters, but rather people who know they need Facebook but don't want a full-fledged net/notebook just for that purpose (see also: a large proportion of iPad buyers). They'll want a TV that doesn't feel broken when offline. Windows Media Center, since it's used to locally-stored video, will be a little more independent from the Web. Microsoft has another wild card: Silverlight. Once deservingly derided as a massive hulking piece of crap, Silverlight, a browser add-on that plays lets you play videos, has really come into its own and is presently one of the best rich-content delivery 'wares around. The transformation has come largely by way of Bing Maps, which uses Silverlight to render its incredible Photosynths, which you can drop your jaw watching in this TED talk by Bing Maps' head honcho, Blaise Aguera y Arcas. Sure, it's proprietary, and sure, it requires considerable processing power to do its job right. But Silverlight is also powerful and versatile; just ask Netflix (NFLX), which uses it to run its Watch Instantly feature. Redmond also has plenty of experience installing Windows-derived software on all kinds of resource-limited embedded devices, from ATMs to tourist kiosks. Because the margins on TVs are so low, retailers rely on moving them in bulk to make money. There's not a lot of room for an ultra-expensive spate of TVs in the home electronics market; if only a few people are buying them, it's not worth it for retailers to stock them, and few of us would buy a TV (say, on Amazon) without seeing it first in person. In other words: they need to be cheaply spec'd, so they can be cheaply sold. Chrome OS and Android don't need a lot of horsepower, but Microsoft already knows how to built reliable software for very, very spartan devices. Not everyone shares my prediction. My colleague John Carroll at ZDNet argues in "How Microsoft Loses the TV Space" that while Silverlight is great software, and while Microsoft has been focused on TV for decades, its "inability to move with a coherent purpose across product lines" -- its internal confusion -- will keep it from moving deftly into the space. That very well may be; Carroll has worked at Microsoft, so he'd know. Building on the strength of Windows for PCs and Windows for phones, we are upgrading our entire portfolio of platforms and technologies for the embedded market with Windows 7 technologies to better serve our partners and customers in the embedded space. Since Windows 7 Embedded will operate on both set-top boxes and embedded TVs, it allows Microsoft to bet on both smart TVs and their potential (if underwhelming) fleet of rivals, set-top boxes like Vudu and Roku. And it also has an excellent lead-in service in the extremely popular and addictive Xbox Live, which it can both bundle with its future TVs, and afford special features to people running both an Xbox unit and a Microsoft-powered TV. Count one for an unusually well-prepared Redmond: that marks one version of Windows (since Windows 95) that hits the timing just right -- and it might win them the next generation of TV buyers. Better yet, it might rub off on the rest of the company's projects.